Panecal is a scientific calculator application for technical work such as information engineering, mechanical engineering, dynamics, measurements, and construction, an essential item for engineers and science students. 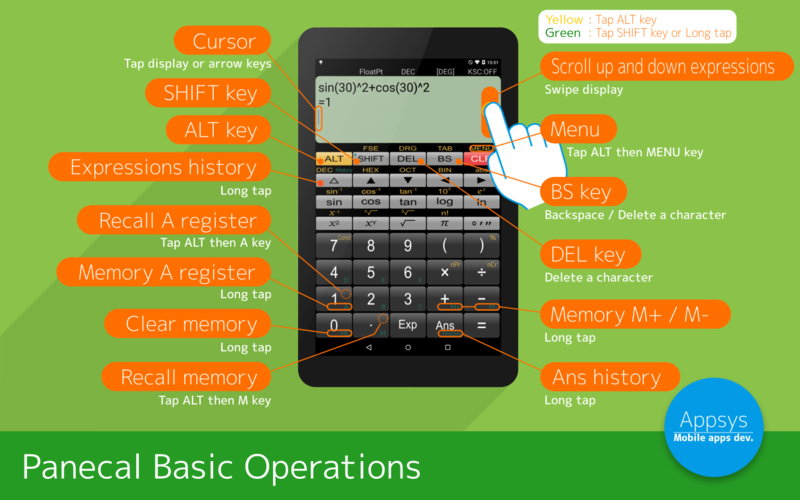 Panecal scientific calculator can display and correct mathematical formulas. You can use it to check formulas, which enables you to prevent input errors and calculation mistakes. Panecal has functions such as editing and recalculating calculation formulas entered in the past, as well as the capability to use variable memory to only change specific values and do calculations. A cursor is displayed on the screen, and you can tap the screen or push arrow keys to quickly move to the location you want to edit. Panecal allow you to swipe to scroll through formulas, as well as copying and pasting using long tapping, which makes it a strong and flexible application with an intuitive user interface. [Disclaimer] Please note in advance that Appsys is not responsible for any damage or lost profits caused by the use of this software, or any claims from third parties.